Already on sale in Brazil, India launch of the new Hyundai Creta facelift is scheduled to take place in a few days. The new Creta facelift for Inida is now ready for launch. Bookings have opened and launch is likely to take place this month. 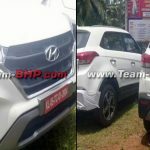 The car was spied by Team BHP while it was parked inside a dealer yard. 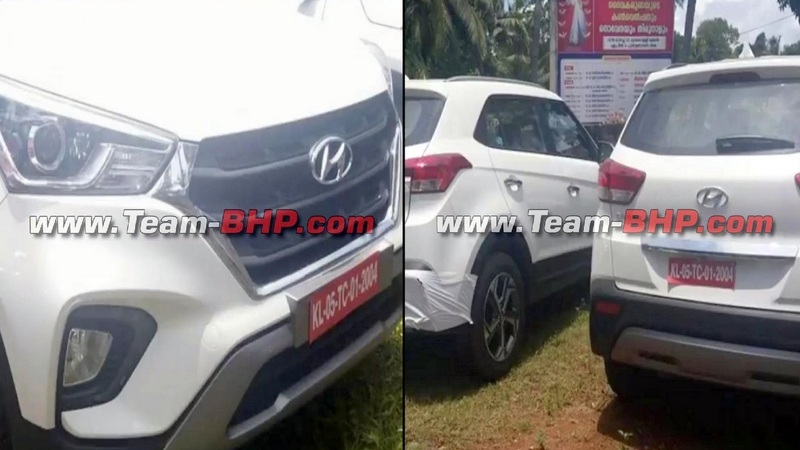 This is for the first time that the front and rear of the car has been spotted undisguised. 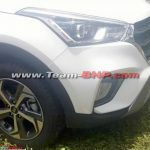 Compared to the current Hyundai Creta, 2018 Creta has a chrome lining surrounding the front grille, revised bumper style, and horizontal fog lamps. At the rear, tail lamp design is revised, while there is a thin chrome lining running between the tail-lamps. Biggest addition is that of a sunroof. 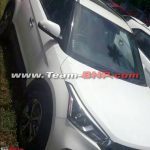 Hyundai Creta facelift will continue to be offered with the same set of engines as has been seen on the current variant. These include 1.4 liter diesel, 1.6 liter diesel and 1.6 liter petrol. Performance will remain same as before, 1.4 D will deliver 90 PS and 224 Nm torque, 1.6 D will deliver 127 PS and 265 Nm torque, 1.6 P delivers 123 PS and 154 Nm torque. 5 variants will be on offer – E, E+, S, SX and SX(O). There will also be new colour options on offer along with dual tone paint finish. Top end variants will now come with infotainment system that is compatible with Apple Carplay and Android Auto. On the inside, dashboard layout remains same as before, so does seats. What has changed is that now you have height adjustable driver seat, wireless charging, USB charger, arm rest, 6 airbags, ABS, etc. Expect the new Creta to be priced in a similar range as the current Creta. Bookings have opened already while deliveries are set to start from later this month.